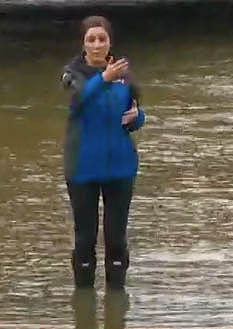 KTVB Channel 7 is this year’s first winner of a coveted DOPE REPORTER award for standing in flood water along the Boise River wearing a pair of boots when the only reason to stand in the water was theatrics. In her stand up appearance during the Friday 10 pm newscast she noted the water was “up to our calves.” Had she stood in a different spot, the water would have been up to her chin! This was a difficult award to make because her report explaining why there is still space in the reservoirs (to allow for future known snowpack to runoff) was otherwise well done and timely. But fair is fair. We posted a WARNING February 23 about playing in the puddles. Readers are encouraged to make nominations, along with images if possible. Great call! Reminds back in the 90’s while watching one of the local news stations (I forget which one) an anchor man asked a reporter at a flood scene in the foothills “Please describe for us – if you can – the devastation you’ve witnessed”. The reporter got a pained expression on his face and responded “Well, I wouldn’t call it devastation, but I would call it damp”. That anchor deserved a dope award, and the reporter deserved a candor award! I do wish I could remember their names. She’s putting together a demo tape to send future employers and a water shot was needed. Hoping a station will pay her a living wage one day. Don’t worry Morgan, we love you. But the man is right. Please spare us the unnecessary props, and dramatic punch. We had a sprinkle today not a monsoon. Most of us have seen this several years before. Yawn. The more educational facts and detail the better as far as I’m concerned. News tip. Follow-on story. We do a huge amount of cloud seeding around here and hit the jackpot this year. That’s why all the water. Yes really. Sorry about all the flood water and dead fish, but wow! Jackpot!!! Gotta wonder how long a mining company owner would be jailed for if he killed all those fish? Also, two of our Boise drainage dams are nearly identical to the one in California that nearly fell down. Probably built by same engineers. Look at Lucky Peak emergency spillway; it’s also a dirt hillside which will wash away if the primary spillway fails. Anderson Ranch does not appear to even have an emergency spillway. Arrowrock is 100+ years old. Maybe fix up the dams a little instead of building Dave’s train? They get younger (cheaper) and stupider every year. The “Gretchen” at one of the stations has such a hickey accent that she is in watchable. The irony is that she is a pretty good reporter and the only reporter at 7 that I can stand. Classic hurricane reports are my favorites. Imagine poor Morgan’s humiliation, if a reporterette from Channel 2 or 6 had been wearing hip waders in even deeper water!!! Can you buy irrigation boots with the inches pre-printed on them, in big white numbers? As soon as I saw the report I thought of your award! Chem trails.. your summary of the three Boise River dams is incorrect in all aspects. C’mon. She did a fine story. I wish the fake news spewing anchormen of the national “nightly news” would visit Fukushima and stand in the crater where the nuclear meltdown material vanished into the earth. Sorry Eric, but I’m correct. Perhaps info-babe will do a story on the three dams. In the meantime they are easy to view with google earth and numerous photos on the internet. Arrowrock opened in 1915. I’ve long been a critic of Dave’s Dope Awards – and I’ll restate it again. These reporters are often doing hard work with little resources and lots of pressure. Getting harangued on a blog for wading in water or wearing a no-mex shirt is completely unneeded. Wading in the water DOES help illustrate the story and does NO harm. If Dope Awards were given for errors made by local newsies might be one thing – but this criticism continues to be misplaced. The hard work they’re doing involves deceiving the public with endless homicidal cops and dead suspect stories while those events have actually been falling for years and are near all time lows. Repeating every terrorism story ad nauseam, even though most are being proven as “false flag” events meant to scare Americans into endorsing the rising police state. Covering every poor person criminal act, while ignoring the rich folks and politicians massive crimes and ongoing rackets. I feel nothing but contempt for the corporate media and the nonsense they pass off as “news”. I long for the days when our local news channels provided real in-depth information and investigative reporting on government corruption (remember KBCI and Mayor Coles). Perhaps then we would have less of our taxpayer money spent on studies for F-35’s, downtown choo-choos and private stadiums for out-of-town billionaires. I guess when these reporters barely make more than minimum wage this is what we get. Sad. EDITOR NOTE–Spoken like a true professional! Best acceptance speech ever. Donald, is that you again? Morgan – sorry but I do not watch channel 7 or 2 or 6 or 9 or 12 “news”. Maybe if these stations actually aired some meaningful and worthwhile information I would. I do not need to have some talking head tell me the water is high and the river/canals are unsafe or the latest crash on the connector or the biased slant on anything Team Dave is dreaming up. As others here have stated when real “news” begins to be reported I may tune in. Take a listen to Don Henley’s Dirty Laundry. It was spot on back in its’ day and unfortunately things haven’t improved since.